Day 5: Speech # 2 – Going political! After the adrenaline rush of my first speech, it was time to get down to reality. The second speech in the CC manual is “Organize Your Speech”. I think that THIS speech was and remains one of the hardest for me to write because I had no idea what to write about! There are only billions of subjects out there but I wasn’t sure that I had anything to talk about. This was where my personal insecurity kicked in. I was ‘just’ a stay at home mom. I didn’t have a glamorous career behind me. I didn’t have any exciting hobbies or even any mundane ones! The exciting things that had happened to me weren’t fit for public consumption, and in any case, I wasn’t even close to being ready to talk about them. That was when it occured to me…..why was being a mother such a bad thing anyway? Why did I feel ashamed because that’s ALL I was? I was everything to one little girl, surely that must count for something. It took a while for that idea to kick in but when it did, the writing was easy. I was rip-roaring mad. That was the battle cry of my mother during her stay at home career with her three unruly children. I imagine it is the cry of all mothers at one time or another. My mom raised her kids in the 70’s, a time when women were being encouraged to throw off the chains of motherhood and embrace the blissful career of their choice. What a time of social upheaval! One of the biggest changes we’ve experienced since then is women entering the workforce in numbers unseen before. We’ve also seen the appearance of childcare centers as a way of life. Childcare. What does that mean? The child is being cared for. But who can do that better than a child’s own mother? I appreciate the strides that have been made in making the world a more fair place for women. But I feel like we’ve cheated ourselves out of the greatest gifts of life as we have marched into the working world and sent our kids off to be raised by strangers. We seem to have literally thrown the baby out with the bathwater! The role of motherhood has been under attack for some time now. 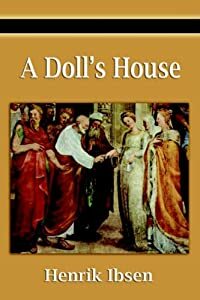 Henrik Ibsen’s play “A Doll’s House” written a over a hundred years ago seemed cutting edge at the time with it’s protagonist mother leaving her family to “discover herself” but it was only the beginning of a wave that crashed over the families of the world, leaving many of them motherless. Western society has tried to cheapen the work of mothers- proselytizing to them through various media that their vocation is frivolous and can be done by any trained monkey. Girls have been told that a truly meaningful life, a life that is valued and that shapes the world, can really only be found outside the home. My generation fell for this propaganda hook, line and sinker. Motherhood was portrayed as unglamourous drudgery. It was insignificant. We were convinced that if you did it at all, it was something that you did after the glory days of your real career; a mere coda to your working life. Women who went directly into motherhood did so because they couldn’t cut it in the real world. They were the losers that needed a man to take care of them. What blasphemy! How many of us fell for this codswallop? And how society has suffered because of it! How many trained monkeys do you know that can perform the roles of cook, nutritionist, teacher, spiritual advisor, psychologist, chauffeur, event planner, bookkeeper and most importantly, kisser of owie’s? The corporate world continues to encourage this relatively new myth because more women in the work force means cheaper labour and more profit for the luxury class. Basic supply and demand. And how they have reaped the benefits of our insecurity. A study commissioned by Salary.com in 2006 to determine the market value of a stay at home mom found her worth to be almost $135,000 per year. And that is, of course, not measuring the intrinsic values of raising a child. But despite what a mother’s worth may be in the home, the unfortunate truth is that many families can’t pay a mortgage or put braces on their kids’ teeth unless they have that second income which usually requires them to put their children into day care. My friend Ella, ironically a day care worker, faced the choice of putting her daughter Katie into a day care or not having enough money to keep their home. What a hellish choice! She cried to me on the phone one day, heartbroken. In the end, she chose to go back to work to teach other people’s children new words, new skills and the values that will drive their lives. And for five days a week, eight hours a day since, Katie has had someone else teach her new words, new skills and helped to shape the values that will drive her life. Ella is one of the mothers who has been convinced that it is reckless to give up a family home before giving up a family. Maybe if the workforce weren’t stifled with so many mothers working for 60% of what men make, their spouses might be able to pull in enough money for them to stay at home and teach their own kids new words, new skills and the values that will drive their lives. I’m willing to bet that most women would rather be their child’s primary caregiver if it were financially feasible. So what do mothers do? How can society make it possible for mothers to mother their own children again? It doesn’t take a genius to see that children who are cared for by their own mothers are loved and understood better, encouraged and observed more intently than those who are cared for by paid workers. It’s also equally obvious that mothers who can look after their own kids will carry a lot less guilt and experience the degree of joy only available from the privilege of raising your children. A good start obviously helps a healthy future. It is in society’s best interests for mothers to raise their own kids. Numerous studies have been done to articulate both the pro and con sides of stay at home moms. But really, do we need to spend one more dollar to see what has always, until recently, been common sense? And as for those who claim that they want women to have more influence in society I ask: What is more influential than being everything to one child? This Christmas, a special time of remembering family, please tell a stay at home mom how much you appreciate her work. It might keep her from going round the bend that day.